A Crazy Canuck Living in Zany Italia! : Berlusconi vs. breasts! Our “Great Leader”, Berlusconi, is always prone to shooting his mouth off, especially when it comes to foreign leaders and women. Recently, Albania’s prime minister, Sali Berisha, came to meet good’ol Silvio in Rome. During the press conference, Berlusconi made a comment on the “landing in Italy of beautiful Albanian women”! Now, many people might not find anything terribly wrong with that comment, especially the average Italian male-chauvinist who enjoys Berlusconi’s “puns”. But in the past (and even now actually), many of these so-called “beautiful Albanian women” have sadly ended up on Italy’s shores as prostitutes, not exactly one of their ultimate goals of living the so-called Italian “Dolce Vita”. This has been because of rather poor economic and social conditions in Albania as well as illegal immigration that has stemmed from that nearby Adriatic country. Many of these women have been the victims of ruthless pimps, members in countless cases of the Albanian mafia (and not only the Albanian one). 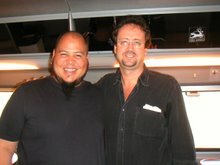 Many have also died in an atrocious manner at the hands of both their “Johns” and pimps. Joking on the plight of these poor women is not at all funny, except when it comes to Berlusconi naturally. Berlusconi isn’t new to these kinds of “sexual” escapades, both verbal as well as physical (according to some young ladies who have frequented on more than one occasion the prime minister’s official Rome residence, Palazzo Grazioli). The bottom line is that these so-called “hilarious” puns and anecdotes rarely go unnoticed by other countries: take for example Germany. 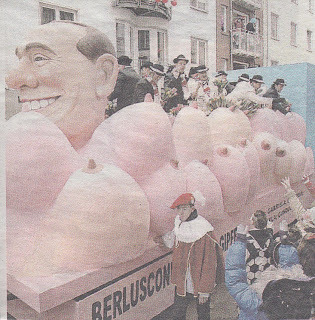 Cologne’s carnival was apparently followed by 1 million people, and Silvio’s presence was indeed rather amusing, as one can see by the attached picture: his head is surrounded by various female breasts! While Gordon Brown or Canada’s Stephen Harper may not be loved by all Brits or Canadians, I doubt very much that the average German would present the two foreign leaders in the same way as they did with our beloved “Great Leader”! Italians, especially those who have lived abroad (as in my case), have to constantly put up with jokes and quite often even racist remarks on the mafia, spaghetti and pizza. All that they now need is to be constantly associated with Latin lovers à-la-Berlusconi!